Adam Coleman, MA History of Art student, joined the Birkbeck team to give his first tour as part of Open House London, the initiative that first sparked his interest in architectural history. I’ve always been a fan of Open House London since moving here back in 2002; on reflection, I think that my interest in architectural history (and in particular post-war social housing) is probably attributable back to some of my early tours of estates like Camden Council’s Alexandra Road. The event has always struck me as a great entry point for the general public into architectural history, so it felt the right platform (and the right time) to ‘switch sides’ as it were and be the person giving the tour, rather than the one going on it. On Saturday I was pleased to join the Birkbeck team (steered by the incredible Eva) to contribute to the programme of tours at Gordon Square. The tour I led tour focused on Birkbeck’s RIBA award-winning cinema, completed by Surface Architects in 2006. I followed this on Sunday by co-leading tours of Tottenham’s Ferry Lane Estate, a low-rise housing estate of 750 homes completed by the Greater London Council (GLC) in the 1970s. The opportunity to co-lead tours of the estate came about somewhat serendipitously as a result of research undertaken for Birkbeck’s Graduate Certificate in History of Art, which I completed in last academic year. As a result of my research, I had already been in contact with the estate’s active Resident Association and when I suggested that they enter Open House to mark the 40th anniversary of the estate’s opening they were enthusiastic. Without the buy-in of the Residents Association a tour would not have been possible – or indeed appropriate – and the collaboration meant that the tour could combine my architectural research with resident insight into estate’s dramatic lived history (which saw various tussles with the GLC and a high-profile case of squatters occupying an empty block). The estate had always fascinated me since moving to Tottenham five years ago, and the research I undertook only deepened my interest; leading to more questions rather than solid answers about its built form. It was built during a period of great change in British history which witnessed a Conservative Government’s forced dismantling of the British Welfare State combined with a growing public dissatisfaction with modernist architecture, typified by the high-rise point-blocks of the late 1960s. 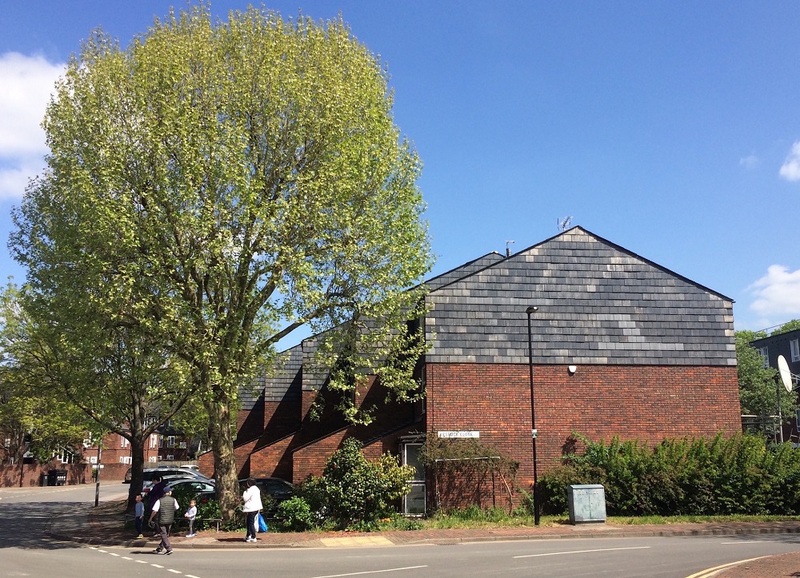 The estate combines two contrasting housing typologies (medium-rise flat blocks and low-rise terrace/street housing) built in a consistent neo-vernacular material vocabulary comprising red brick and slate-hung upper levels. The plan of the estate is informal: private, semi-private, and public spaces combine in an irregular manner with strong natural landscaping throughout. My particular line of enquiry concerned the way in which its built form reflects this period of British history, and the extent to which it can be understood as a progressive example of estate planning which combines modernist ideas with emerging postmodern thinking. Social housing (or lack of) is a very ‘live’ issue in Tottenham, as elsewhere in London. Local residents are currently joining forces to campaign against a controversial planning application which would see a commercial developer build over 1,000 flats in 13 tall towers, with not a single home at genuinely affordable or Council rent being proposed. It certainly felt like an apt moment to acknowledge the vision and ambition of GLC’s Ferry Lane Estate.